Be sure to set a new password and create a password reset disk to prevent future loss. 2012/06/19 — Updated screenshots to match latest version. Added warning about encrypted files. This is a dangerous weapon. But it is quite helpful for someone who forgot Windows password! actually,There are some little tricks that might help when you forgot password. Step 4: Press the Enter Key and then you can be able to login the default windows administrator account which is it created by default when install windows. Note: When you input the key combination Please don't put the cursor on any account. And if you change the name or password before, you cannot login by this way. Last week my parents changed my password, which was really annoying. I tried to get it back. My computer is Win XP and at first I tried the ctrl+alt+del+del thing but it said it can’t do it because of ‘account restrictions’. Then I went for help in a forum and they told me to download the software Password Genius. It’s quite easy and I recovered my password at last. What live CD to use XP or vista for windows 7? Hi, I tried the vista live cd but it doesn’t look like the tutorial shown here. 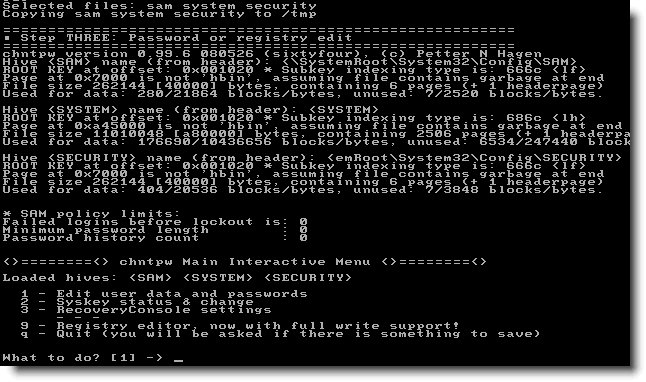 Il loads a graphical interface, it tries to crack the password(with no success). I whould like to clear the password. Not sure why he posted a link to ophcrack. The utility from the screenshots is located here. Downloads are towards the bottom. Worked for me. Thanks! I found this info for long! I got ERROR: Failed to copy registry file sam. when i am in a step two i tape 1 and i go back to step one. hi, you can solve this problem because I am in the same situation with my asus notebook with Windows 8.1. If you know something please help me. Recently I have tried Offline NT Password & Registry Editor with Windows 8.1 system and it doesn’t work. Eventually I managed to remove my forgotten password using a program called PCUnlocker.